Discrete geometry, with emphasis on the geometry of rigid and flexible structures, is my main area of interest. A tensegrity is a structure composed of sticks held in mid-air with strings which, nevertheless, holds its shape. This can be modeled very nicely as a configuration of points with upper and lower bounds on the distances between certain pairs of points. This in turn leads to interesting problems in, and applications to, distance geometry and the theory of packings and coverings of spheres as well as applications to robotics, protein folding, motion planning and percolation problems in physics and probability. Another subject of interest is the theory of flexible surfaces. There are triangulated surfaces that flex, keeping their edges at a fixed length, and it has recently been shown that such surfaces maintain a fixed volume while they flex. There is no perfect mathematical bellows. This is also related to a polynomial that relates the volume of the surface to the lengths of its edges. This is at the intersection of discrete geometry, algebraic geometry and topology. Straightening polygonal arcs and convexifying polygonal cycles (with E. Demaine and G. Rote), in preparation. The Kneser-Poulsen conjecture for spherical polytopes (with K. Bezdek), submitted. The Kneser-Poulsen conjecture (with K. Bezdek), Crelle's Journal, J. reine angew. Math. 553 (2002), 221–236. 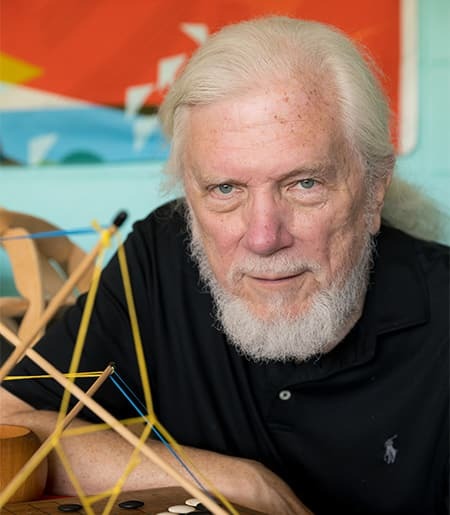 Tensegrity structures: Why are they stable? ; in Rigidity Theory and Applications (M.F. Thorpe and P.M. Duxbury, eds. ), Kluwer Academic/Plenum (1999), pp. 47–54. Mathematics and tensegrity (with A. Back), American Scientist March-April (1998), 142–151.